Pest description and crop damage Adult stink bugs are all shield-shaped, with a triangle-shaped section in the middle of their backs. They are generally up to about 0.5 to 0.6 inch long. The name stink bug refers to the strong odor the insects can emit if alarmed. The consperse stink bug is pale brown, yellow underneath with red antennae. The green stink bug is bright green. Brown marmorated stink bug is brown with alternating white bands on the antennae. Nymphs are similar in shape to the adults and come in a variety of colors. Stink bugs cause damage to plants by sucking sap from buds, flowers or fruits. Large green, brown, or gray bugs that cause deformities in cherries make the fruit unsalable. Damaged fruit is pitted, similar to hail damage. Injury usually is confined to fruit clusters or a single limb. Damage usually is around May 1. Biology and life history Adults overwinter in groundcover. They feed early in the season on weeds and may move later into other host plants. 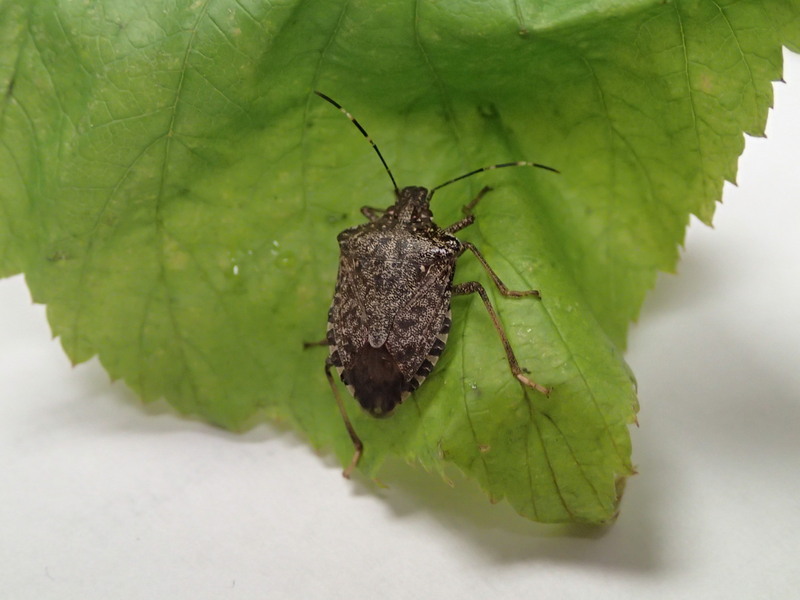 Stink bug damage is worst in dry summers, when alternative hosts are dried up. esfenvalerate (Asana XL) at 4.8 to 14.5 fl oz/a. REI 12 hr. PHI 14 days. Treat in April. Extremely toxic to fish and aquatic invertebrates; avoid spray drift and runoff to surface waters. kaolin clay (Surround)-Repels some insect pests when applied as a spray to leaves, stems, and fruit. OMRI-listed for organic use. thiamethoxam (Actara 25WDG) at 4.5 to 5.5 oz /a. REI 12 hr. PHI 14 days. Actara is extremely toxic to bees exposed to direct treatment or residues. Do not apply Actara between the pre-bloom (swollen bud) and post-bloom (petal fall) growth stages. Do not exceed 11 oz /a per season.